Welcome to The Homemaking Party! I'm so happy you're here visiting as I've got a very yummy recipe for you to try out! Do you love lemon? I do! Lemon cake, lemon tea, lemon chicken...it's one of my favorite flavors. Today I'm showing off a recipe for Lemon Tea Cookies. Unlike any other recipe I've found, these ones are definitely full of tart lemon flavor. Combine flour, powdered sugar, and cornstarch in a bowl and mix with a wire whisk. Zest the lemon and squeeze out the juice. Then stir in the zest, juice and yolk until it's all well blended. Scoop the mixture onto ungreased cookie sheets and bake at 350º for 10-12 minutes or until lightly golden around the edges and not doughy in the middle. Even if these did not sound delicious (which they DO), your presentation of them in that lovely picture would make me want to try one (or two) . . . I love lemon anything! The cookies look elegant and wonderful! I'm always so impressed with your photos! Can't wait to try this. I'm in love with anything lemon too! Thank you for hosting and the yummy recipe. I love stuff with lemon, they sound so good! Yay I love this. Thank you for teaching me how to make these. I will be sharing in Pinterest. I will try to make these soon. Thanks for the Homemaking Party! These look absolutely yummy! Can't wait to try them! Sarah, my mouth is watering just looking at those cookies. Just need to figure out how to make them GF and lately, Keto-friendly. Now, I need to go brew a cuppa. Those cookies look SO good! 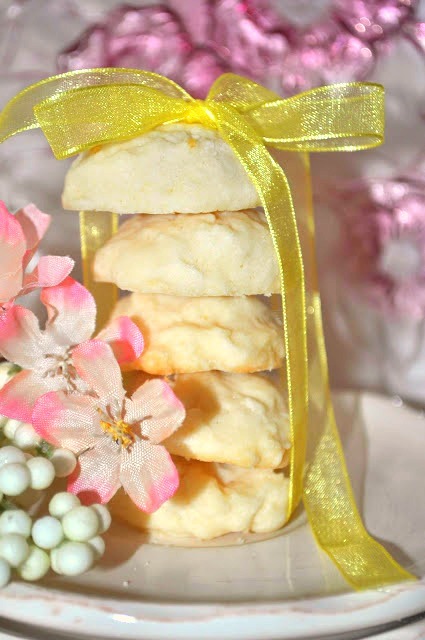 I love lemon and always looking for cookies to serve at tea parties and these fit the bill. I just harvested some of my lavender - I may try these with lavender added! Sarah, your lemon tea cookies look like something I need to be having with my next cup of tea! Thank you for hosting. My husband loves lemon desserts so I am always on the lookout for new ones. I will try this! Thanks! Your cookies look amazing we love the flavor of lemon! !